Cedar Springs girls pushing through the heat at Lowell. 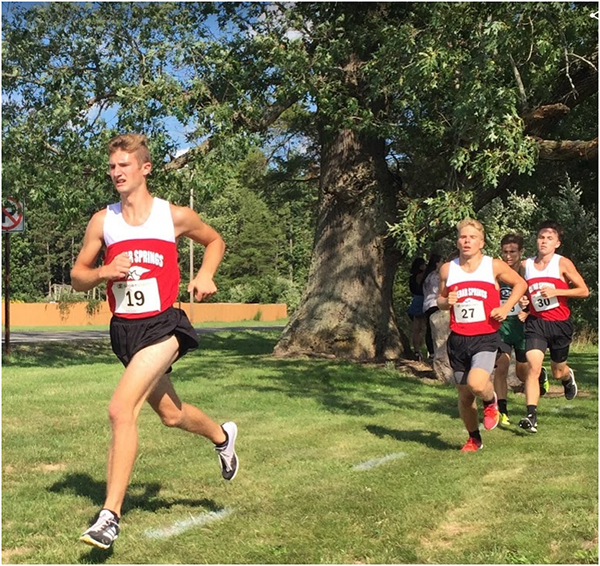 From L to R: Corey Bowers, Jaydon Moleski, and Dilan Sargent running at Lowell. The stifling heat didn’t keep the Cedar Springs Boys Cross Country team from winning the first OK White conference meet on Wednesday, September 5, at Lowell High School. The team went 1-3-4-12-15 for a team score of 35 points. It was a close race between Cedar Springs and Forest Hills Central, who took 2nd with 42 points. Scoring for the Red Hawks were Corey Bowers, Dilan Sargent, Jaydon Moleski, Gavin Braciak, and Austin Mann. “Everyone ran great today. We knew the times weren’t going to be fast, but Lowell’s course is probably the toughest we will see all season, and when you consider that along with the heat today I thought everyone ran admirably. I told the team pre-race that more than times I just wanted to see them racing hard out there and competing for spots. Every point matters in meets like these and I was glad to see that kind of fight from everyone,” said Coach Lacy. The lady Red Hawks had a sixth place finish for their first conference meet. Scoring for the girls was Maggie Prins, Jill Detweiler, Ally Ladd, Marjorie Hosking, and Isabel VanDusen. “The girls ran so well despite the weather. I’m proud of them for fighting through the tough elements. 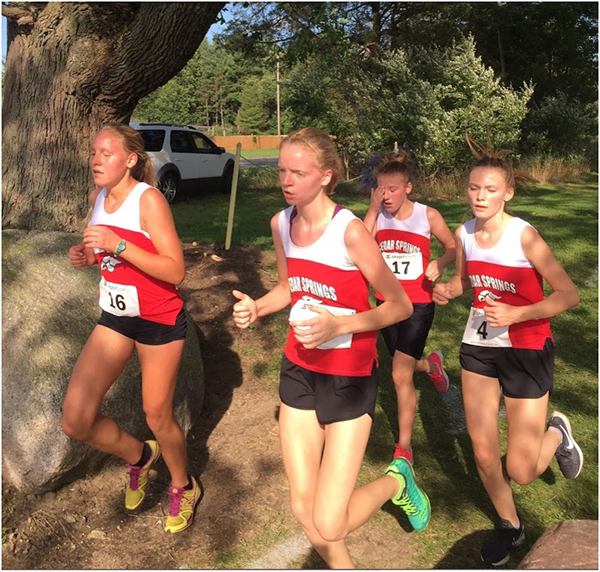 This was the first conference meet and we have some work to do but with it being so hot and the course so challenging I’m proud of the girls for helping each other out and working together to do the best they could,” said Coach Stressman. 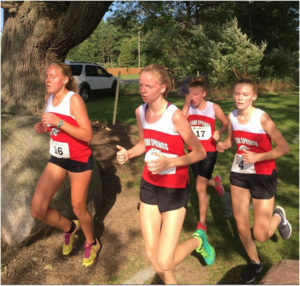 The Cedar Springs Cross Country team traveled to the Central Montcalm Hornet Invite on Saturday, September 8, where several members of the team walked away with a season best or a lifetime personal best time. Several also walked away with hardware for their efforts of placing in the top 25 of their race. This meet was different from traditional meets as each runner competed only against his/her grade instead of as a team. Leading off for the girls was senior Carolanne Merlington, who finished with a time of 28:07 placing 21st. Juniors Jill Detweiler and Tonya Tepin placed 10th and 14th respectively in their race with times of 24:26 and 25:11. Next the sophomores took to the course where Maggie Prins placed 6th with a time of 22:43, followed by Marjorie Hosking 13th (24:41), and Antonia Eigemann coming in not far behind at the 15th spot (25:11). Next for the lady Red Hawks was Paige Marsman securing a medal at the 22nd spot with a time of 26:03. Hannah Helton ran her season best with a time of 37:57 placing 31st. Each of the freshman girls medaled and got personal best times. These ladies included Isabel VanDusen (23:35, 6th), Lily Howland (24:32, 11th), Ally Ladd (25:08, 15th), Madison Golliver (25:31, 17th), Julia Peckover (26:04, 20th), and Emily Caldwell (26:39, 21st). “This meet was fun to watch and coach. The girls are going to do great things as the season progresses. We’ve just got to keep working hard and doing the little things that makes us better,” said Coach Stressman. For the boys, the three juniors on the team finished in the top six of their race. These individuals included Dilan Sargent (17:08, 2nd), Jaydon Moleski (17:13, 3rd), and Gavin Braciak (17:50, 6th). Each sophomore came away with season or personal best times and included Corey Bowers (16:40, 1st), Austin Mann (18:09, 7th), Alex Nylaan (20:21, 24th), Sam Kleynenberg (20:39, 27th), Caleb Menefee (20:50, 30th), Justin Voskuil (20:52, 31st), and Logan Douglas (21:03, 34th). Each of the freshman boys medaled and came away with some personal records as well. These boys included Carter Moleski (19:06, 4th), Gabe White (19:57, 9th), Cayden Steinebach (20:03, 10th), Gabe Minnich (20:58, 17th), and Trenton Murphy (21:41, 22nd). “We were very grateful to finally get some cool temps to race in, and the boys did not disappoint. We had members of our team at the front of the pack in each grade level race, and nearly every member of the boys’ team came away with season best times. We have a lot of work to do yet, but this was a big step forward in achieving the goals that we have set for ourselves this season,” said Coach Lacy. The team travels next to the Sparta Invite on September 15.